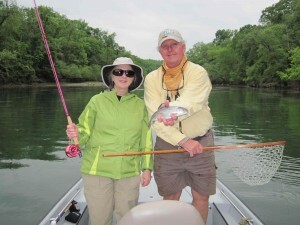 The Mid-South Fly Fishers in Memphis, TN, has long been an active supporter of conservation efforts and fishing improvements on the Little Red River. 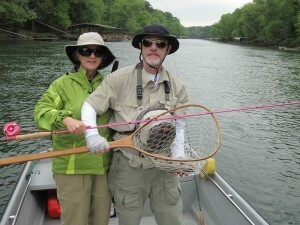 Last weekend they held an outing on the Little Red River and on Sunday we got to take two of the club’s members, Luther and his wife Patsy, on a trip. The weather was really threatening severe thunderstorms but we managed a full day of fly fishing. Patsy had recently purchased a “hot” pink Elkhorn fly rod, reel and fly line at a Mid-South Fly Fishers auction event supporting cancer research and she was looking forward to trying out her new rod. As you can see she landed some nice rainbows with her beautiful new rod. Patsy even let Bo make a few casts with her rod and it is not only a unique looking rod but it also casts great. Luther did some really nice spey casting with his switch rod and all in all is was just a nice day. It is wonderful people like Luther and Patsy that make Mid-South Fly Fishers a successful organization and fly fishing such and enjoyable sport! Hope you will support your local fly fishing organizations!